Well, not one Tuscany vineyard or winery, but hundreds! This is Part Six of the collection of Italian vineyards and wineries in Maremma: undiscovered Tuscany and Lazio and Italy's best kept secret, despite the fact that her lands have always been home to some of the best wines in the world. This page covers all of the Tuscany wineries and vineyards by location from R to S - Riotorto to Suvereto in Maremma. The links for Parts One to Five that take you from Alberese to Populonia can be found at the bottom of the page. Enjoy planning a visit and discovering Maremma's wonderful DOC, DOCG and Super Tuscan wines! 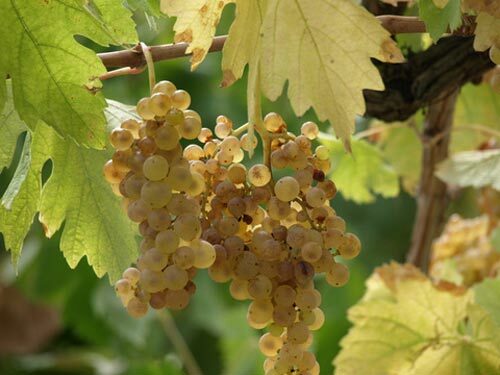 The photograph above is of Vermentino grapes in the ©Poggio Argentiera wine estate in Alberese, Maremma. 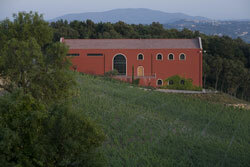 This organic wine estate also offers holiday agriturismo apartments within a restored colonial house. Established in 1988, Caiarossa is situated in the heart of the Val di Cecina close to the coast and within the protected wildlife area called, "Il Giardino" (the Garden). It is now owned by Eric Albada Jelgersma (also the owner of Château Giscours and Château du Tertre in Margaux, Bordeaux). Twelve vineyards of 11 grape varieties. The architectural lines of the winery follow the oriental Feung Shui discipline, designed by architect Michael Bolle. Read the exclusive interview with Dominique Génot, enologist and director of Caiarossa. An organic wine estate established in 2000 by winemaker Luca D'Attoma and Elena Celli on previous uncultivated lands along the Costa degli Etruschi, Azienda Vitivinicola Duemani now comprises of over 7 hectares of vines over three vineyards. Podere La Regola is a family-run estate - brothers Luca and Flavio Nuti - situated in the valley of the Cecina river within Montescudaio DOC territory. The first bottled wines were produced in 1997, although the family has produced wines for their own consumption from the establishment of the farm at the beginning of the 20th century. Established in 2002 by three friends Elisabetta Foradori, Giovanni Podini and Thomas Widmann, the estate of Ampeleia comprises of 50 hectares of Cabernet Franc, Sangiovese, Cannonau, Carignan, Mourvedre, Alicante and Marsellane grape vines in a variety of plots near Roccastrada. Wine tasting and tours: wine tasting is available in the Ampeleia shop and tours are possible. Open every day. Mustiaio is a vineyard of 12 hectares, the main grapes of which comprising Sangiovese along with Merlot, Cabernet Sauvignon and Ciliegiolo for its red wines, and Vermentino with Trebbiano Toscano, Malvasia and Riesling Renano for the whites. Agriturismo Podere La Cerreta is an organic farm that also offers agriturismo holiday accommodation, horse riding lessons and horse trekking with Maremmano horses. Cantina Vignaioli Morellino di Scansano is a cooperative of 152 vineyard owners covering 400 hectares in the comunes of Scansano, Magliano, Manciano, Campagnatico and others in the province of Grosseto. They process around 33,000 tons of grapes a year! bottling 20% of the production of wine in the Morellino territory. The vineyards and winery of Fattoria Le Pupille are the brainchild of 2006 "Woman Winemaker of the Year", Elisabetta Geppetti. From a 1970's farmhouse with 2 hectares of Sangiovese vines, the Fattoria now comprises of ten vineyards over 420 hectares in the area surrounding the headquarters, near the hamlet of Petra and in the districts of Magliano, Scansano and Grosseto. Wine tasting and tours: Wine tasting - with or without complimentary Maremman food - is available upon advanced arrangement. Third generation family-run vineyards in the Monteregio di Massa production Marittima area on the hills of Scarlino, they have been producing wines and olive oil since 1957. Wine tasting and tours: Upon prior reservation (via the website), wine tasting and guided tours on Tuesdays and Fridays. The La Pierotta estate, owned and managed by the the Rustici family, lies at the foot of the Monte d'Alma within the heart of the Alta Maremma Toscana. From a beginning of half a hectare of vines in 1957 for the production of wine for the family, the estate now has 13 hectares of vines within the "Denominazione di Origine Controllata Monteregio di Massa Marittima". Wine tasting and tours: La Pierotta welcomes you to their azienda to taste their wines in ther "sala di degustazione". The three and a half hectare vineyards of this azienda vinicola are the creation of three friends: Giorgio Buceli, Paolo Trappolini and Carlo Filippeschi who together founded Piandibugnano in 2001. Lying at the foothills of Monte Amiata the 65 hectares estate of Podere Il Casion comprises of 28 hectares of crops, 4 hectares of vines, 6 of olive groves (with 350 between 200 and 1000 years old Olivastra Seggianese trees) and 18 hectares of arable land. the farm was certified as organic in 2006 and produced its first bottled wines in 2007. It is run by Anders Gautschi and Franziska Burkhardt. The wine estate, restaurant and farmhouse holiday apartments of Azienda Agricola Gualdo del Re - located a few kilometres from the Etrsucan coastline in Maremma - are owned and run by the Rossi family. This imposing wine estate in Maremma Livornese is owned by father and daughter Vittorio an Francesca Moretti and comprises 300 hectares of vineyards, olive groves and woodland. The infrastructure was designed by Swiss architect Mario Botta and will make you look twice and then again as you catch it with your eye for the first time, for it looks like an alien spaceship that has landed on the hillside! Completely different from any other Tuscan winery that I have seen.